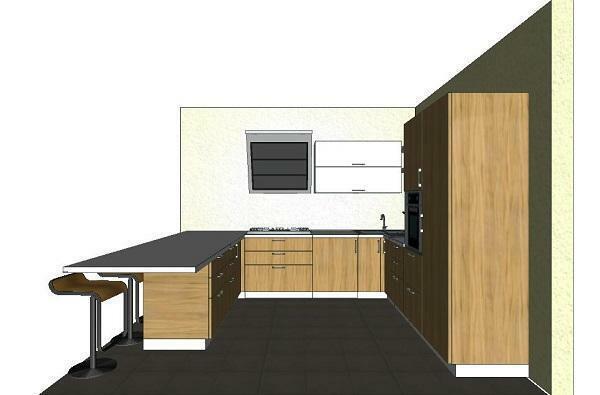 The U-shaped kitchen, if well designed is probably the most functional model, with the main work areas set around the person who will use them. Surely it is more difficult to design than other types. We have repeatedly stressed that, when you are about to buy a kitchen, there are some considerations to make to be able to design the best composition, to avoid mistakes that could affect its functionality. It is not, in fact, the aesthetics the only useful parameter to be taken into consideration, both in the case of compositions of small size, and in the case of more spacious kitchens. Very often, indeed, the availability of large spaces leads to design errors with the result of having many furniture but little functionality, while, paradoxically, more spatial constraints lead to study how to make the most of every helpful corner. 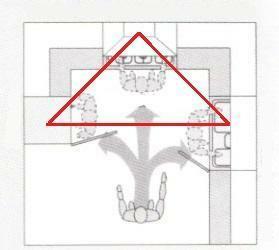 It is in fact the corners the real problem of a U shape kitchen, since there are two. Fortunately, all the manufacturing companies have technical solutions for this type of basic-furniture, and so it can be freely selected depending on available space and needs. We begin with the consideration that the U-shaped arrangement, if well designed, is probably the most functional of all, since it allows to have the main work areas arranged all around the person that uses it, in order to avoid too frequent displacements or distances. We have also already reflected on the fact that not necessarily the dimensions of the three sides of the composition should be particularly large. 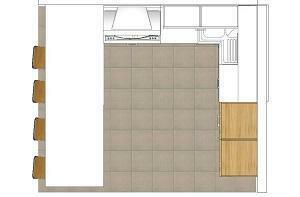 However, if you want to allow two people to simultaneously use the space/ kitchen, there are minimum sizes below which it is not convenient to place U shaped furniture but is to prefer a composition with the two sides in line placed parallel. We say that the size 1.80/ 2.00 mt is to be considered the minimum for the inner side of the three that make up the U. In this way you leave the right space between the two arms to allow, for example, a person to be able to open a base in drawers or doors from a front comfortable position while, at the same time, another pass comfortably behind without colliding with anyone. In general, we take as a benchmark the ideal work triangle, formed by the location plan of the three appliances: sink, stove and refrigerator. The first two should be positioned as close as possible, so as to avoid dangerous movements of hot pots, but not so close as to risk that water splashes cramming on the fires, or even worse, in pans with hot oil. Hence the famous triangle assumes sizes and different proportions depending on the various solutions, which must obviously take into account the hydraulic and electrical systems, unless one is about to operate in the ideal situation of a new construction. Consistent, therefore, with the measures and the space available, our U-shaped kitchen will also consider specific connotations of personal habits and the number of people living there. The compositions, in fact, may vary also due to the choice of containers full height as the columns, compared to a smaller presence of wall units. In this case the depth of the columns, smaller than that of the bases, allows greater freedom of choice for the rest of the furniture. Obviously closet contenitive columns and columns with appliances must be placed at the beginning and/ or end of the composition, to not interrupt the linearity of the work top. The problem of the furniture for the corners is another feature of this type of kitchens, with the aggravating circumstance that there are no less than 2 to manage, as already pointed out previously. 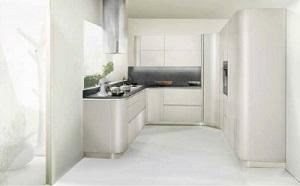 In addition, each manufacturer has its own specific measures and modularity. The simplest solution is always to start from two corners, adjust the position of the built-in appliances, and then place the other bases. The last of these, if the resultant space does not allow an insertion of element series (normally 15 cm wide), can be resolved with a filler to size, perhaps without door, if large enough, in order to have an open container for spices and small appliances. At the bottom of this measure (6-10 cm) because the depth of the base is 60 cm, it is advisable to close with a small panel of the same material of the doors, otherwise there would be a space unusable and difficult to handle because not very accessible, mostly receptacle of dust and dirt. All these considerations are of course in general. We go down instead in more detail, with examples of the composition. 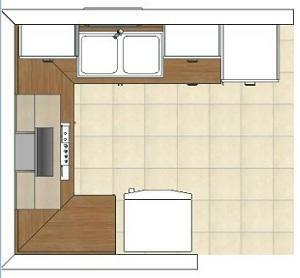 A classic example of modern composition of a U-shaped kitchen is one that provides, as a third side, the solution with a peninsula for breakfast or large enough to replace the table for lunch. It is a solution which I would define as typical of the modern open spaces, where the kitchen and the living room complement each other and often the furniture are provided by the same company. In the example the composition provides an equipped peninsula, ie with the contenitive bases that not only structurally support the 90 cm deep top, but they are containers with drawers and baskets. The 90 cm deep top can be able to exploit as a lunch top, due to the overhang of 30 cm to comfortably accommodate your legs and sit upright. The work triangle hob/ sink/ refrigerator is perfectly functional, while the spaces between the various appliances on the work top allow to be able to work in a comfortable exploiting them as support surfaces for the preparation of meals or settling for small appliances. the sink has a modularity 90x90 cm with doors which open completely leaving freedom of management of the interior of the base, while the other base corner is L-shaped, it closes with one door and with fixed shelves, or with equipment in removable shelves, like magic corner. Fillers were not included because of the presence of the peninsula, freely positioned in the plant. The two columns are arranged side by side at the beginning of the composition. 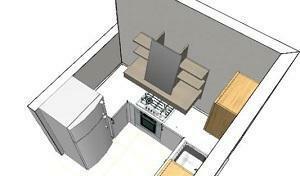 Another typical example is that of kitchens with the three arms of the composition placed on the walls. 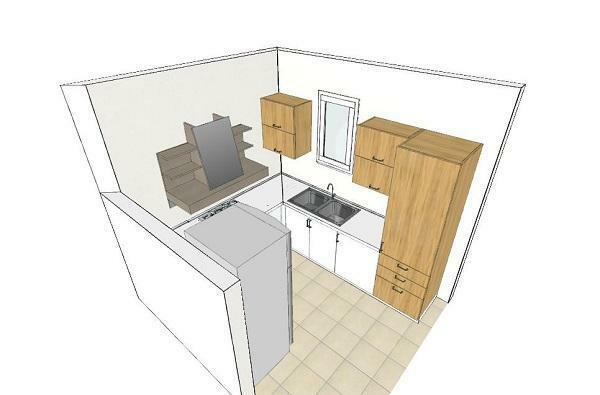 In the example the solution covers a rather small space, where the minimum measures enables only one person at a time to work comfortably, otherwise it would not be possible to open doors and drawers. In this case both bases are L-shapedngled, each with door and fixed shelves. 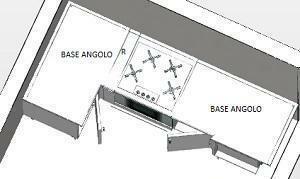 It was necessary to include a filler that closed the space of 11 cm between L-shaped base and on the left the base with built-in oven. The measure available did not allow to insert any removable base, (normally bases rack width 15 cm), then we chose the simplest solution of the small closed panel. Alternatively, you can place small brackets attached directly to the two sides of the bases to take advantage of all the space, however small, available, without adding thickness. Valutation: 5.00 / 6 on 2 votes.